See the related TOXNews - ROBatt Grant Awarded. ROBatt is a tiered testing strategy consisting of a battery of four alternative ocular irritation assays, which will replace the regulatory mandated acute ocular irritation testing using the Draize Rabbit Eye Test. ROBatt is comprised of the Chorioallantoic Membrane Vascular Assay (CAMVA), the Bovine Cornea Opacity/Permeability test (BCOP), the Porcine Cornea Opacity/Reversibility Assay (PorCORA) and the Porcine Confocal Assay (PorFocal). 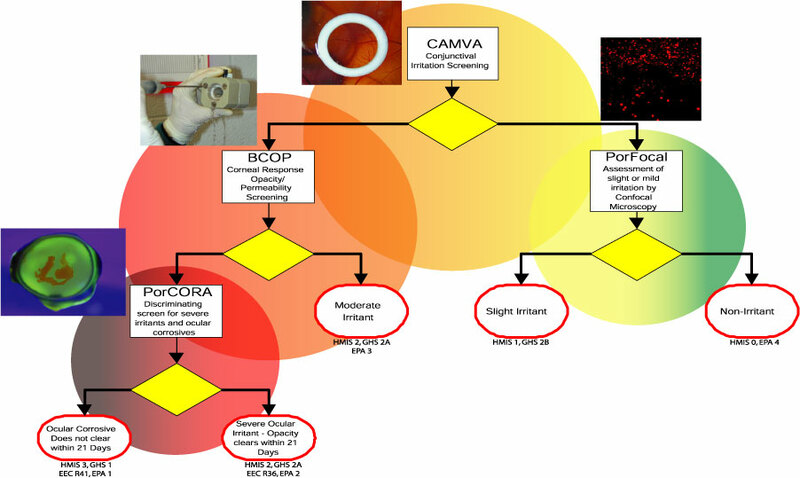 This tiered strategy follows a decision tree that allows for a thorough evaluation and categorization of test materials for ocular irritancy potential. A current challenge facing regulators is to eliminate the use of live animals in eye irritation testing, which will allow categorization of irritation from non-irritating to corrosive. Efforts to meet this challenge have been met with very limited success because, alternative tests must satisfy the regulatory community (i.e., FDA , EPA, OECD, HMIS, etc.) with a level of conservatism as the current Draize eye test that use rabbits, which has been used since 1944, and has proven to be a reliable method for safety determinations. However, this test has been criticized for its lack of reproducibility and use of live animals. All current information indicates that a Tiered Testing Strategy is required to meet this challenge today. The Replacement Ocular Battery (ROBatt) brings together already-proven alternative ocular irritation assays and new test models to classify ocular irritation according to HMIS, EEC and GHS criteria. Efforts toward the 3 Rs: Reduction, Refinement and Replacement of the Draize test have been going on since the mid-80s, with moderate progress to date. In the ICCVAM Test Method Evaluation Report: In Vitro Ocular Toxicity Test Methods for Identifying Severe Irritants and Corrosives (NIH Publication 06-4511), the expert panel recommended the use of two ocular alternative tests to classify severe ocular irritants and corrosive materials. ICCVAM agencies accepted the recommendation, but it must be stressed that sub-severe results using the recommended alternatives require additional animal testing. Some agencies still prefer the use of animals in safety testing to rule out sub-severe toxicity. Having worked with alternatives for Draize since 1988, we feel confident that the battery of tests proposed in this program will fulfill the public and scientific requirements as a standalone replacement strategy for ocular irritation. This battery provides classification of ocular irritancy and, critically, an estimation of recovery potential. Time to recovery after exposure to a possible irritant is an endpoint of particular interest to regulatory bodies, such as the US EPA, OECD, WHMIS and HMIS regulations. These agencies classify ocular irritancy not by severity but by the time for the injury to heal (OECD, 1967; WHMIS, 1988; HMIS, 1996; EPA, 1997). The availability of ocular toxicology methods that can protect human health without using animals for toxicological assessment of cosmetics, consumer products, petrochemicals and pharmaceuticals is of great importance to modern society. Approximately 70,000 work-related eye injuries occur every year which result in millions of dollars in lost production time, medical expenses and worker compensation. Chemical exposures make up a significant percentage of those injuries. Clearly there is a need for robust predictive information regarding the ocular irritation potential of products. This battery has the potential to provide this critical information without the use of live animals. A noteworthy aspect of a 4-assay tiered battery is that a test material is exposed to multiple test systems, thus excluding single test-system error or insensitivity and including critical internal checks and balances.